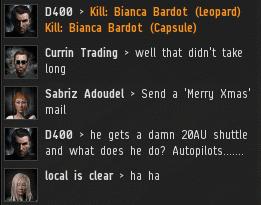 Many a merry Christmas was had in highsec last week. But the New Order spreads holiday cheer all year. Here's a sample of the bliss shared by our Agents during the week of December 22nd @ 00:00 EVEtime through December 28th @ 23:59 EVEtime. DiaRosCris wasn't fooling anyone with her souped-up shield tank. 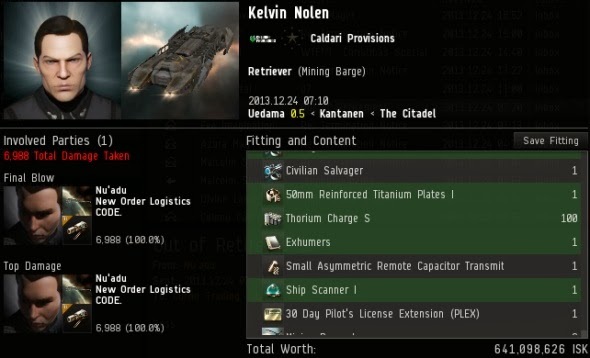 Remember, carebears, faction shield mods sitting atop a cargo-fit Orca just means more stuff for our Knights to loot after they kill you. Agents Quinn Barviainen, D400, Dillon Hawk, Sophia Soprano, loyalanon, I Bigfoot Ikkala, Nu'adu, Cholo Dejesus, Rick Therapist, Brutal Anna, Johnny O'Donald, and Rip Thy Jacker killed this lovely 1.2 billion isk Orca. There's that thousand-yard stare again. Yes, DiaRosCris was the pilot who managed to lose a freighter by taking it through lowsec just to haul a single shuttle. The horrors of her life haven't ended, it seems. If you thought this was a Minmatar Shuttle, look again. 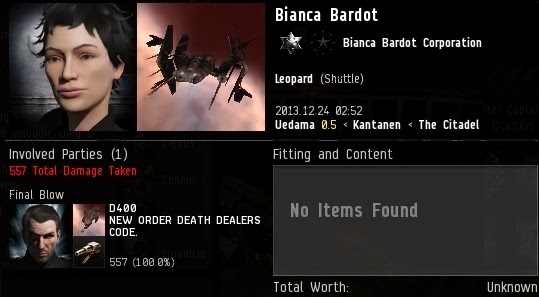 Bianca Bardot lost her special Leopard shuttle almost immediately after receiving it from CCP. 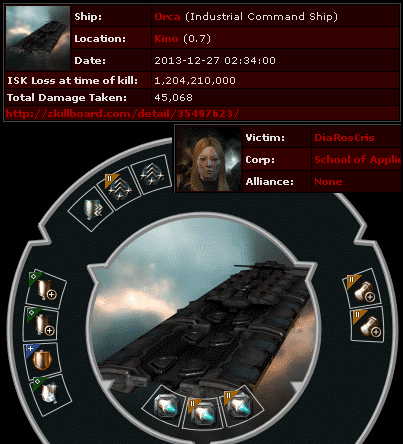 Agent D400 won the race for the first Leopard kill. We've killed several more Leopards since then, and they're well on their way to becoming extinct. They have special warp speeds--as fast as a leopard. But how fast can the Code be enforced? Faster than a leopard! 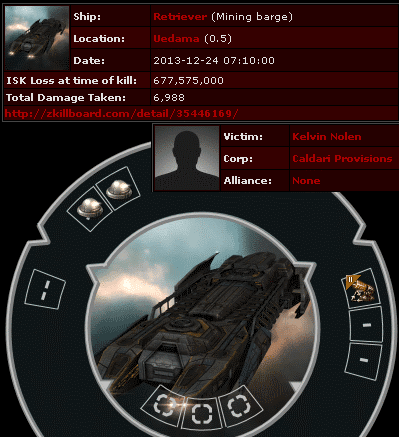 Soon after Agent Nu'adu returned to highsec to enforce the Code, he came across Kelvin Nolen's 641 million isk Retriever. That's a pretty pricey Retriever--the PLEX in the cargo probably has something to do with it. But at least Kelvin tried to tank his Retriever. ...Or not. Mining in an untanked Retriever with a PLEX in the cargo, in Uedama system of all places. Sigh. 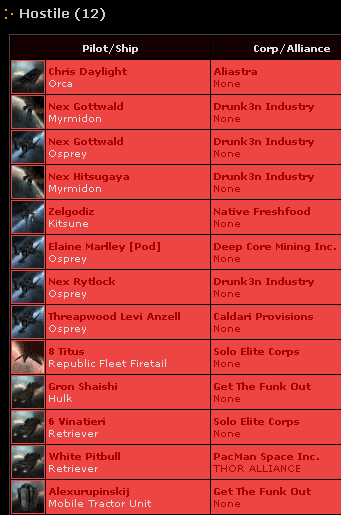 So much work still to be done in highsec. Abe Rubenowitz was a bit peeved when he saw Agent Orions Lord killing a Retriever. So he stepped up to the plate in his Raven, prepared to play the role of the rebel defender. It ended exactly as you'd expect: He went boom. 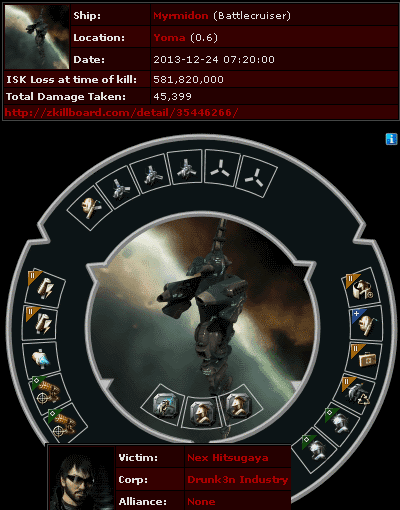 Anyone flying a battlecruiser worth 581 million isk obviously doesn't expect to lose it. So much for that idea. Johnny Laue was autopiloting on Christmas Day with a pod worth 2.9 billion isk. He might call Agent D400 a grinch for popping him. Actually, D400 was playing the role of Santa Claus. Johnny's dead pod was a gift to everyone else in highsec! 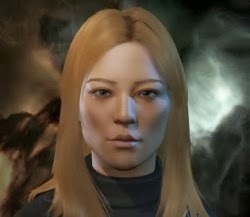 If I ever play eve again, it would only be to help the agents of the "New Order". 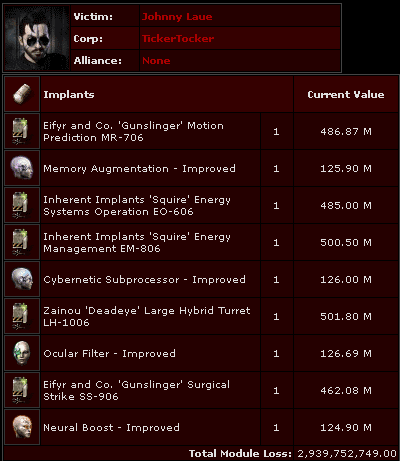 Seems like fun is not in the cards for the majority of the rest of the EVE universe citizens. I only had fun in the game getting in on a couple of ganks with you guys. My problem is I don't get the time to play it like you need to be effective. I dropped my account about 5 months ago (Sal Corleone). Some day I shall return when time is more available. I do enjoy reading the blogs and forums. Very well written and makes me laugh. Make yourself useful and visit an ice belt in Osmon. There is a blob of about 30 Procurers-boots, loading a freighter from time to time. Just this once some non-AFK miners would appreciate some help. That is if you truly want to do something about boots on belts and not just to grief the miners. I didn't know that the littering of boots was such a problem in high sec. I will make sure to recycle leather in the future. 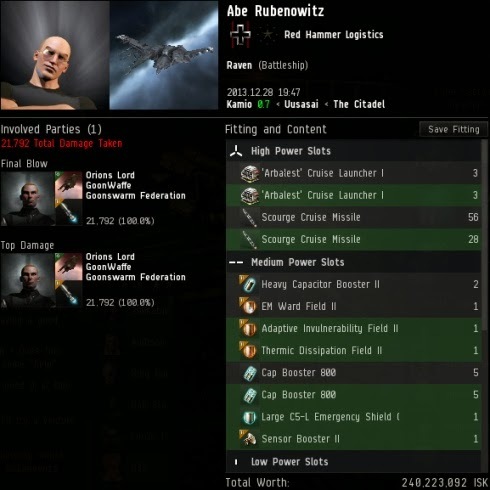 [22:34:05] AK > how many procurers does he have? [22:34:48] CH > Plus Orca. [22:34:59] CH > Or Orca is not of that botter? [22:35:55] wi > anyone notice.. fleet Procurer seems to be following Cobrik around in the Shuttle... something to watch. [22:36:50] CH > That's some lack of life, lol. [22:46:02] CH > He is not picking them up yet? [22:49:23] FA > we did it!! [22:50:30] CH > Look at the lifetime.